The Manitoba Historical Society has a number of events planned for later this month at the Dalnavert Museum. From October 23 to November 7, a pilot project called Phantasmagoria will explore the history of film, photography and video in the Victorian era. Featured artists include Danishka Esterhazy, Wendy Sawatzky, Noam Gonick, Irene Bindi, Sherrie Rennie, Aston Coles, Helga Jakobson, Andrew Milne, Doreen Girard and others. The display will be available during regular museum business hours. On October 23 at 7 p.m., a panel discussion to launch Phantasmagoria will look at early cinema and spirit photography, featuring history professors with extensive Victorian knowledge. Admission to the event is free of charge and open to the public. As space is limited, please RSVP to bookings@mhs.mb.ca or (204) 943-2835. 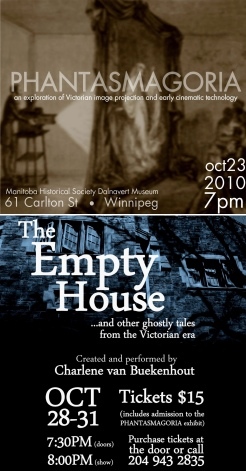 From October 28-31, The Empty House will present tales from the Victorian era performed by Charlene van Buekenhout. Ghostly tales will be told by candlelight in the attic of the historic Dalnavert house, including works by Algernon Blackwood, Bram Stoker and others. Tickets are $15 and includes admission to Phantasmagoria. Show time is 8 p.m. The Dalnavert Museum is located at 61 Carlton Street.